The 'sawdust' was now a brilliant white 'pulpy' mass, and as I spread it out on a pan to dry over a turned-down heating lamp, I noted its complete lack of smell and fine 'grainy' texture. “What happened to the stink?” I gasped. “The two stenches canceled,” said the soft voice. “Stirring in that material will accelerate the development of the compost into fertilizer, as well as increase its value as a plant nutrient.” I had chemicals waiting on me, so did not think to spend an hour spading a mixture of horse manure and 'too high' leftover food in with the stomach-turning mess left by the treatment of sawdust with lye. The pulp was nearly 'dry' when I returned to the basement, and as I stirred it with a small brass rod, I noted its increased friability over what I had initially seen. I thought to leave it as it was once fully dried, and then add it in small amounts, much as I did with the glycerin to make the first batch of nitro. The 'nitro' was now a clear and brilliant yellow of 'fluorescent' intensity that seemed to give off showers of 'sparks', and as it lay 'coiled and malevolent' in the bottom of the beaker, I wondered how to remove the gray-tinted 'dirty' water that lay above it. I found a larger pipette, and once the water was 'gone', a faint 'chemical' smell 'shot' up my nose – and a crushing 'migraine' followed with such abruptness that I nearly collapsed on the spot. The pain was so intense that even with my eyes open, I could not see; and by feel and 'sense' I added first the urea, then began slowly decanting the remaining 'blasting oil' – it was 'oily' enough to earn that label – into a small jug. Only when I had finished the job and corked the jug did the headache begin to abate – and then, I spoke. By the time my vision was 'passable' and the headache mostly gone, the pulp was not merely entirely dry, it had gained yet an added measure of friability; it was so crumbly that the slightest touch of the brass rod seemed to turn its small and irregular lumps into a grainy dust. I began 'scooping it up', then wondered, “how am I going to, uh, filter that stuff?” The obvious answer: some of the filter paper we had looted from the Abbey. “What will it do?” I asked. My thought was cut off instantly by faint and glowing letters starting to show on the wall of the fume hood, and as I noted the aged and stained sheet copper turning into a mottled shade of pale 'electric' blue, I wondered more – at least, until I actually read the sign. “Uh, why?” I asked. “Really strong stuff?” I then had a question. “At least it won't leave the mill bad, I hope,” I murmured. Soft steps came closer, and in the corner of my eye I saw Hans. He was rubbing his head, and when he came to my side, he seemed to be 'vibrating' with fear. I was about to 'start' the nitration process itself: the thermometer was at its minimum level and the mixed acids were fuming crazily – and I wanted to sneeze until my nose fell off. “Uh, no,” I murmured, as I used the tip of an old brass spoon to add a small amount of the whitish 'dust'. In the blink of an eye, I could almost 'see' fumes starting, and amid recollections of gouting clouds of brick-red fumes I stirred rapidly. The silver line on the inside of the thermometer shot up like a rocket, and it came within the width of a thread to a previously hidden red line. Thankfully, the temperature went back down quickly with prayer and continued rapid stirring. “That cellulose is too dry,” said the soft voice. “Turn it into a thoroughly damp paste, and then try adding about half of what you just did.” I wordlessly handed the container with the 'cellulose' to Hans, who brought it back a minute later looking like a species of grayish 'mud'. With trepidation, I used the tip of the spoon again, this time scooping up what looked like 'half' as much. “What is this?” asked Hans, as I added another 'smidgen'. “That's not merely higher than where you came from, but higher than is usually possible here,” said the soft voice, “and the usual material has significantly more energy and brisance here as well.” The unspoken portion was obvious to me: nitrocellulose was 'mean' that way too. “What is this word?” asked Hans. I presumed he spoke of 'brisance'. The additions of cellulose continued, one 'smidgen' per minute with continued stirring. Twice, I had to stop for a minute or so, once because of a particularly 'fierce' bit of cellulose, and the other because I had to add a bit more salt to the ice. It was going to water in a hurry, and as I resumed, Hans came with a bucket, a dipper and more ice. Hans seemed to vanish like smoke, then seconds later, I heard faint noises above my head, much as if someone was rummaging in the kitchen; then seconds later, Hans came down hotfoot with something. I'd added perhaps half of the cellulose by then, and while I still had to be most careful, the level of care needed wasn't quite as great. I glanced to the side to see a long tapered conical thing with a flat end. The resemblance to a stereotypical 'witch-hat' made first for wondering, and then for barely suppressed laughter – until I saw how the thing had been made. “Uh, for what?” I asked. “Or what? Trouble?” I asked. I somehow suspected that was a part of the problem. “How was this?” asked Hans. “Yes, so it was dirty, and you made it clean,” said Hans. The tension had been mounting by the second as Sarah spoke, so much so that I no longer noticed the burning of the acid fumes. My hands seemed to have minds of their own, for they both continued working: the right stirring with the thermometer, the left hand slowly adding the 'mud'. I had perhaps a teaspoon left, and it was going fast. The reaction had 'tamed down' considerably since the start. “Yes, and what happened?” asked Hans innocently. “Sounds like a good trap, then,” said Hans nonchalantly. A second later, though, the 'concept' got through his head – and he then changed his mood and tone utterly. There was more to what Hans had said than he had spoken, and I kept this matter to myself. The nitration aspect of nitrocellulose was coming to an end; and the truly 'touchy' portion of the process was to come shortly. I then had a question. “Tougher?” I asked. I had but three more 'smidgens' of 'mud' left to add, and then I would need to 'drown' the reaction in ice-water to 'stop' it. Sarah barely suppressed a giggle, then as I heard steps behind me, I wondered just how I could drown the reaction. Beyond 'rain water with some ice in it', I wasn't certain, at least until the shadow at my right suddenly 'vanished' – and I turned to my right to see Sarah with a large crock part-filled with water clustered with chunks of ice. “It will, dear,” I said. “Thank you.” I then added the last 'smidgen'. I would need to keep stirring for another five minutes, or so I guessed; but within seconds, I knew five minutes was far too long. I'd need to dump it in less than thirty seconds. “But you've heard of them, haven't you?” I asked. “How much was that?” I gasped. I thought I had poured all of the product into the ice-water. Hans was looking at the scene in shocked horror; he was frozen by terror. There was no time for for contemplation; I had to act. “Put the salaterus-water into this crock here,” I said. I was almost done pouring. “Hans, get ready to remove that acid-water, and Sarah, put that other crock under the instant he does.” An instant's pause; I finished pouring, Sarah poured some ice-water in my crock. A quick swish-around, then I poured it onto the nitrocellulose. “Move the crock there, Hans,” I squeaked. The instant the crock was gone, Sarah moved another in its place, while I reached for the beaker of salaterus-water. 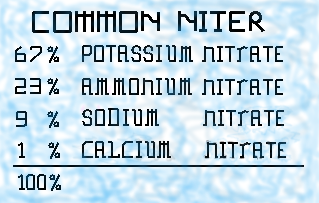 It all went in the 'nitrator', and as it began foaming, I poured it onto the nitrocellulose. I then reached for the jug of rainwater. “Uh, no fizzing?” I asked. A dash of the rainwater, then quickly I picked up the sopping-wet filter paper and dumped the whole thing in the beaker of salaterus-water, which then foamed slightly. It continued doing so while I stirred and Sarah lit the heating lamp under it, and while I continued stirring, Hans cleaned up my 'mess'. “Uh, why so many?” I asked. “What is this of toys?” asked Hans. The beaker was just starting to steam, while its bubbling continued. I was glad it wasn't 'foaming at the mouth'. Hans thought so, and fished it out with tongs. He began walking across the lab, but as he reached the bottom of the stairs, he broke into a run – and as his run became frantic and his steps faster yet, his running abruptly stopped with a muffled thump, followed a second later by an anguished yell from Anna that rang louder than the still-echoing noise of the explosion. “At least it did not...” My beaker's contents resembled a well-stirred 'winter wonderland', complete with 'fog' and thick drifting clouds of 'snow', and with the heating lamp turned down low and constant stirring, the fog slowly cleared with the passing of what seemed half an hour. Only then – the fizzing had stopped, and the 'fog' was nearly gone – did I hear steps behind me, followed by Hans' voice. I needed to boil the nitrocellulose for at least another hour. “That stuff was like that one thing I made for Anna, only it needed no spark,” said Hans. I glanced at Hans, and nearly fainted. Not merely did he have traces of soot here and there still, but his previously-neat and somewhat longish hair – at least, longish for the area; it was but an inch or two shorter than Sarah's – was now mostly gone to charred ragged stubble; and where that was absent, there were shiny reddened patches of bare skin on his head. His clothing was not what I recalled him wearing. “Did it get your clothing?” asked Sarah pointedly. Hans did not respond; nor did he need to, for not ten seconds later steps came from the stairwell and Anna 'announced herself'. I said nothing; I had stirring to do, and I needed to neither flag in my efforts nor give my attention to anything else – for not merely did I need to pay attention to the liquid level, I had to also periodically add small amounts of salaterus, and as the hourglass turned over for the second portion, pinches of 'urea' crystals on a regular basis. Each such addition caused brief spurts of 'foam' that boiled off along with the wisps of steam from the steady boil. “And if I had them?” I asked. “That is good, then,” said Hans. “Then what would it do?” asked Sarah. “That...” Hans was now speechless, and I was as well, at least for a few seconds until I recalled just what I was stirring. The foam lessened with each further addition of urea as well, and at the end of the the time of boiling, I added three final pinches of urea, two of salaterus, and a small amount of rainwater. The winter-wonderland was gone – and it had been replaced by a desert, snow-white in its barrenness, and its drifts were reminiscent of soft waves of ashes covering the crumbling remains of well-charred bones. I left the desert behind me, feeling exhausted, and as I followed the other two up the stairs, the odors of cooking and 'home' seemed to revive me. It felt like sundown, but it only turned out to be lunchtime – a lunch of near-silence amid black-stained mottled gray walls and blacker-still patches that grew steadily larger and darker near the stairwell heading down into the basement – and at the junction of the stairs leading to the basement and the main floor, the walls were the color of nightmares and darkness convolved. Anna would be cleaning for quite some time, or so I suspected. “As they will, uh...” I paused, for my first thought was of burn-piles – and within less than a second, I knew a vastly greater matter: a 'clean' house was a matter of both personal pride and great labor among most women in the area, and while Hans' business was known – and known well, both for its products and its 'accidents' – it was not thought much of an excuse for Anna to be the wife of a chemist. She still needed to have the kitchen looking 'as clean as lightning' – or so the local saying went – and that consistently. The demands upon her time of medical practice were not considered, chiefly as most people were ignorant of the extent of those demands; and Roos being a 'farming' community, most of the community's women did little beyond cook and clean when they weren't urgently needed in the fields. While there was no answer, that was the best I could do between mouthfuls of bread, beer, and soup, and when I went back down into the basement 'alone' – Hans had something he needed to do at the Public House, and Sarah went with him – I wondered more. At least until I recalled the need to make more 'nitro'. “But before that, I need to clean Hans' glassware,” I thought, as I fetched the aquavit. I suspected it would 'clean' things passably. It proved to do far more than that: the amount of 'dirt' and 'grime' that came off of the reaction vessels amid the burgeoning eye-watering fumes was astonishing, and as I cleaned them a second time – some of the spots I'd found were a bit stubborn, and their dissolving had left a noticeable film over much of the glassware – I heard steps coming downward upon the stairs. I turned to see Anna, and as she walked among the shelves and tables, she seemed to be smelling something, at least until she came to my side. I then noticed her state of 'cleanliness'. “Is it true that most women in the area knit?” I asked. “No, because many people aren't much better at cooking than you are,” said Anna. “That I'm worse than you first thought?” I asked. “Is she prone to digestive troubles?” I asked, as I recalled her reaction to Cuew and her talk about vlai. Another pause, during which time Anna picked up one of the pieces of glassware, then shook her head before speaking. “Perhaps you could speak to the walls?” asked Anna. And clamped them closed in a great hurry, as the room I was in was filled with swift rushing dust-and-soot-laden wind that was heading in a hurry for the fume hood amid soft muted rumbles of thunder. As the rumbling noise died away, I once more opened my eyes, and looked at the glassware. It was now entirely clean, so much so that I knew a third cleaning would be unneeded; and when I looked for Anna, she had left my side. I set down the glass tube I had been holding carefully, and with fear in my heart and thundering rumbles still echoing in my ears, I moved up the stairs – to then arrive in a kitchen at once familiar and yet utterly unlike the place I had last seen. “Esther?” I asked. I had only now noticed the pronunciation of Esther's name, and it was not 'es-ter'. Instead, it was 'es-THUR' – with the 'th' sound clearly emphasized, and the second syllable accented, unlike most words in the common language. “Her being sick?” I asked. “And the accent?” I asked. “Is that why people have so much trouble speaking unfamiliar words?” I asked. “What did you say?” asked Anna. There was no answer to my question, at least from that source; but when I spoke of the matter later while making up the second batch of nitro, Sarah supplied a partial one. “Did you have to conceal your ability that way?” I asked. “Why was it 'awful'?” I asked. “Because, uh, of something you or someone else did?” I asked. “What did he usually speak of?” I asked. “Who is this?” asked the voice of Hans from behind me. “Have you gotten into the Geneva?” I asked. For a moment, I wondered as to why we would wish to make so much 'migraine-inducer' at one time, at least until Sarah's sharp outburst. Hans had no answer to Sarah's question, though I suspected I would soon 'concoct' a cure for his 'greed'. With the second batch of nitro 'setting' on a sturdy table where it was out of the way, I thought to make up the 'sample' of gelatin mentioned earlier in the day. My thoughts drove my actions; and when I was 'ready', Hans was still watching me as if I were a mouse and he a ravenously-hungry cat of especially predatory inclination. I prayed silently, then opened the crock containing the nitro. “I would use a glass tube,” said the soft voice of Sarah to my left. She sounded as if in great pain, and when I looked through watering eyes, I noted hers to be slitted and running with tears. I then looked for Hans, and did not see him. “Where did he go?” I whispered. “He's not in the house,” I mumbled, as I used the glass tube to 'pick up' some of the fluffy white nitrocellulose. With my thumb over the end of the tube I was holding, I drew it up slowly, then moved with aching slowness amid a steadily increasing pain growing between my ears. I then let the 'snow' drop, and caught the water portion before it hit the nitro – and as I returned the tube, I watched the snow slowly sink into the brilliant yellow 'syrup'. And as it did, the headache increased exponentially, so much so that it was all I could do to stir the stuff carefully and siphon off the droplets of water that showed. “L-looks like lemon meringue,” I thought, as I put in first one small scoop of the dried 'cellulose', then two scoops of 'purified niter'. I looked to the side, and saw that Sarah was gone also. I was the sole person in the room. “Mix, mix,” rang the ghostly thoughts in my mind, and as I worked with the small carved spatula and added further small doses of 'niter' and 'cellulose', the material looked less and less like lemon meringue. With this growing change, the headache lessened steadily, and when steps came softly upon the stairs, I noted the following: a soft yet unusually firm 'custard' feel, unbelievable stickiness, a distinct yet dilute yellow-white color – just like vlai – and as I added a final dose of salaterus and urea, a potent 'chemical' odor whose nature I could not describe. “What are you doing?” whispered Anna. “M-making an experiment,” I softly murmured. My speech was mangled by gritted teeth and a constricted throat. While Anna was able to find the rag readily, I laid it by the bowl and followed her upstairs. I needed a breather, and I suspected she needed one also. “The Public House?” I asked. “L-light the candles?” I asked. “Uh, any bad sections of ground?” I asked. While I had no good answer for Sarah then, she watched me as I piled as much of the sticky yellow mass into the center of the rag while trying to form a 'line', then used another rag to wipe the spatula and bowl clean. The first rag was rolled up, the second wrapped around it, and a third wrapped around the first two. This made for Sarah's commenting, and I thought her words strange. “That reminds me of a weed-bundle,” she said. “No good 'saving' fuse if we end up dead,” I thought, as I cut three feet. I'd heard that was the 'standard' length for dynamite charges where I came from. Sarah and I went out of the fold with our tools of destruction secreted in a pair of cloth bags tied with string. It was roughly midafternoon, about the usual quitting time for most people who 'labored'; and the fields, while barren of people, were not barren of greenery. Every peaked furrow-top had a long row of stubby green 'spikes' showing, and as we passed house after house along the 'back trail', I wondered which of the houses would need clearing, and when would I have the time to do so. “It's good the place is no longer run to suit the witches,” said Sarah. “Uh, there?” I asked, as I pointed at a copse some two hundred yards past the end of the furthest field to our left. “Uh, who else?” I asked. “H-hard to kill?” I asked. “Where did your first barrel hit?” I asked. “Hence his gut?” I asked. “It is as hard as the better wrenches made today,” said Sarah. “I have heard that is common to do, actually,” said Sarah, as she left the path and began walking down a narrow path toward the spot in question. No one had gone closer than ten feet to this place with a plow, and its hard-packed soil seemed to speak of not merely of a profusion of 'rocks', but a particularly big example 'holding the territory'. “How would they normally remove a big rock?” I asked, as Sarah turned and began crossing the rows. The place was easily twenty feet from the path. Digging with the knife proved Sarah right, as I found the rock to be roughly about an inch deeper than the overall length of the knife. While the soil was friable enough for 'plowing', poking with the blade established the rock as easily being three feet across, if not more. “How deep do plows dig?” I asked. “And if it stretches more?” I asked. I was afraid to, but did not speak of my fear. I held up the fuse for Sarah, who then lit the match while sheltering it with her hand. A touch of the flame to the end of the fuse, and the hissing spit of smoke told me enough. The two of us 'took shelter' behind the wall as the fuse continued its smoky travel. I was glad it burned slowly, for it still had half its length to burn by the time we had taken cover. The distance might have been fifty yards, yet for some reason, I was most glad of the thickness of the stone wall. We wanted something that would stop flying rocks. Sarah looked at me, then peeked up. Time seemed to be slowing. And a sudden brilliant flash of white actinic light seemed to blot out the sky and the sun as a noise painfully sharp and intense all but imploded our eardrums. As the 'electric-sounding' roar echoed off the houses and in my mind, I looked up to see rocks flying high into the air and heading westward. Sarah looked up, yelled – and then ran like a frightened hare. I ran after her, and as I reached the buggy-way of the house in question, sharp crackling noises began pounding above our heads – and by the time we were inside the place, the crackling noises became a steady rattling patter of 'throw-rock'. “What was that?” I gasped. My ears were ringing almost as bad as when the Swartsburg went to hell around me. Before Sarah could speak, someone yelled – and then from near the Public House, a door 'slammed', then another door banged like a gunshot, then someone began firing an obvious revolver. I burst out of the front door of the buggy-way to see a trio of black-dressed 'beings' running at full speed up the road – and as I watched, first one stoop to our front billowed smoke, then another, then two more. A witch stumbled, fell; his two mates continued, even as more stoops became smoky and the booming of muskets became an unsteady rumbling. At twenty paces, the lead-witch of the two seemed to acquire a sudden limp, and his partner left him behind. I could almost feel the well-hid mules they had secreted nearby, and when Sarah startled me by yelling 'Now', I acted unthinking. My first shot struck the lead witch an inch below his ear, and as that man began to 'tumble', the limping witch suddenly seemed to freeze in mid-stride – and then flung himself, arms and legs flying crazily, to then sprawl clumsily upon the ground amid a steady and growing gunfire from both our right and left that raised dust-spots in the road about both black-dressed bodies. A club at least three feet long, with carved pyramid-shaped wooden spikes. The darkened color of the spiked end spoke of it 'doing business' before. I came to the 'second' witch, and noted that he'd been turned into a 'sieve', while the witch I had shot looked to be similarly ventilated – or so I thought for a second. “Someone cleaned this wretch's ear,” muttered one of the coopers. It took me a second to recognize his voice as a familiar one, and nearly another second to recall his name: Dirk. “I think he was one of them who was first shooting at these thugs,” said Dirk – who then looked up to see several people coming up the road at a brisk walk. One of them was Hans, who looked more than a little the worse for wear. Hans was shaking, and while he had not gotten into the Geneva, he was functioning much as if he had. His walk was that of a palsied elderly man, while his soot-stained pistol showed all five thimbles mashed. “In a corner, about twenty feet from the door, right?” I asked. Sarah looked at me knowingly, and I looked at the nearest witch. Sure enough, when I turned him over, I saw a small hole about four inches above his 'hips' and but two inches to the right of his spine. “That place just slows them down, or does it?” I asked. The third witch – the one who had first dropped – appeared to have been missed entirely by Hans, or so I thought until one of the neighbors cut through the layers of black-cloth and leather to expose his skin. As Hans spoke of distillate being 'short', the three witches were to be planted in the eastern cornfields; and while he went to 'inspect' their interment, Sarah and I went home. I had a suspicion that I did not wish to be in the cornfields when the 'hole' we made was discovered, and when we actually got inside the parlor, Sarah heaved a sigh of relief. Hans nodded. It seemed a fitting end to a most-violent time.